So I need to blog this now because soon the Blue Ribbon Bakery as I know it (and as you will come to know it, ever so briefly in this post) will be gone. It shall be replaced with a newer, better bakery, or so they say. Yeah, I took these pictures at night. At Christmas. Sue me. 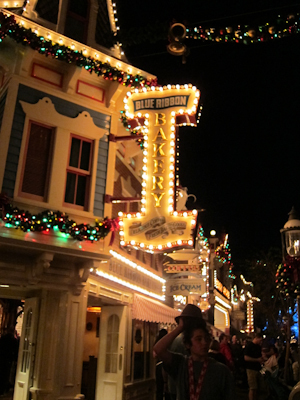 The Blue Ribbon Bakery is about halfway down Main Street on the right. 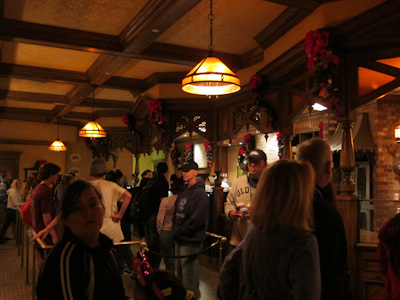 It’s actually located in a small space between the Gibson Girl ice cream parlor and the Carnation Cafe. Although it does not immediately look like it, the Blue Ribbon Bakery is on a corner. And if you turn left onto that corner, you’ll find a very nice bathroom. The BRB serves standard bakery fare. Cupcakes, cookies, rice crispy treats, etc. It also has good hot chocolate and cinnamon rolls. The BRB does not, however, have great crowd control. I mean, the line for the bakery items themselves isn’t too complicated. 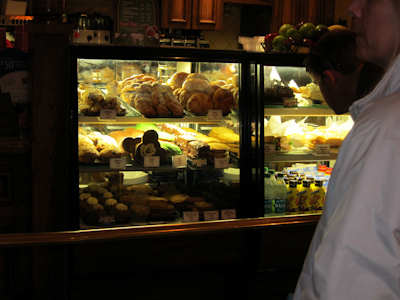 But those people you see in the foreground are not actually waiting for baked items. They are waiting for ice cream next door. 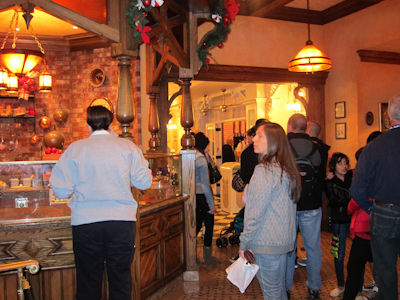 As I mentioned over on my post about the Gibson Girl ice cream parlor, there was very little room for an extended queue there, and it backed up into the bakery. Additionally, the Carnation Cafe–one of the better sit-down restaurants in my opinion–had a rather truncated outdoor-only seating arrangement. No more. 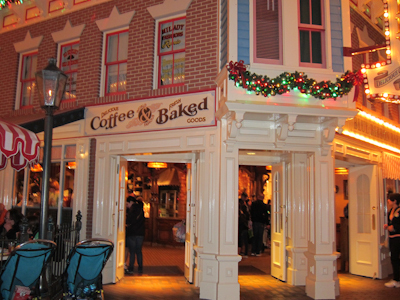 All bakery items are being moved to the Jolly Holiday Bakery (new on the hub, haven’t been there yet) and the space formerly known as the Blue Ribbon Bakery will now be indoor seating for both the Carnation Cafe and the ice cream parlor. While I’m a little sad about the loss of Blue Ribbon, the space is badly needed for both the Carnation Cafe and the Gibson Girl parlor. 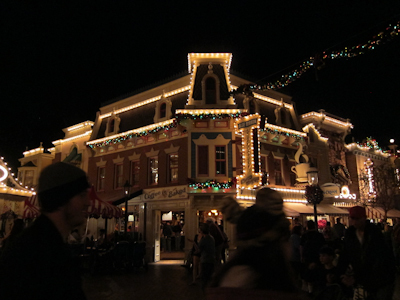 Plus I think the Jolly Holiday bakery and cafe is going to be even better. You can’t stop progress, people. You just can’t.